If you are not familiar with this dish, it may look rather unusual. What is this exactly? Meat-filled snow globes? Fossilized pork parts? 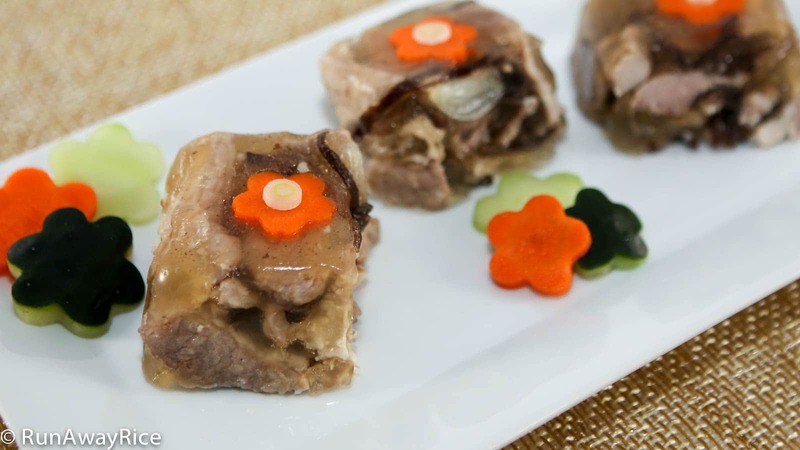 Interestingly, this dish of jellied meat is not distinct to just Asian cuisine, but is also popular in Eastern and Western European cuisine as well. The traditional recipes use meats with cartilage such as hocks, feet, tails, etc., as the cartilage contains the gelatine needed to give the dish its distinct structure. These recipes are laborious to make because the meats need to be thoroughly cleaned and these choice parts are often not the most sanitary. Additionally, breaking down cartilage often takes hours of slow cooking. Thank goodness for packaged gelatine! Now, we can use a leaner, cleaner cuts of meat, cook the dish in a quarter of the time and still have it solidify beautifully. As odd as it may appear, this scrumptious dish is full of flavor and contrasting textures. The savory, grainy pork in comparison to the cold, smooth jelly may confuse your taste buds but once you try this Jellied Pork, your mouth will be begging for more. Use any cut of meat you like but pick something with a little bit of fat which helps the meat to be tender. We cook the wood ear mushrooms separately and then add to the pork in the final step. We do this because cooking the mushrooms with the pork turns the broth a murky, brown color which is not so appetizing. Use any small bowls, cups, molds or pans you have. In the video, I use 8 small glass bowls from Libbey. Cover and store any uneaten portions in the refrigerator. This is best if consumed within the week.